The Sports Kolache: It's Juegopalooza Friday! 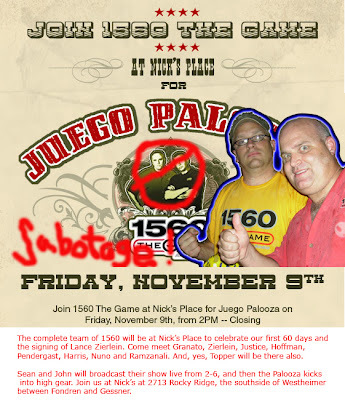 Our sincere thanks to everyone who made it out to Juegopalooza on Friday at Nick's Place. Thanks to you, our listeners, and the deadly combination of your money and your alcoholism, Nick's Place had it's second highest grossing day of all-time! Now that's some serious drinking! You should all be very, very proud (and very, very hung over). Thanks again to everyone! I'm bummed I missed it. You guys sounded like you had a blast! Hopefully you guys got lots of pics! which begs the question...what was the Nick's biggest day??? I don't know whether to be sad that I spent 8 hours at Nicks place or thrilled that it only cost me 70 bucks to drink that long. Hell of a party! Favorite part was Granato showing me some tough love when he pulled me aside and told me somberly "I don't think you're getting laid tonight".